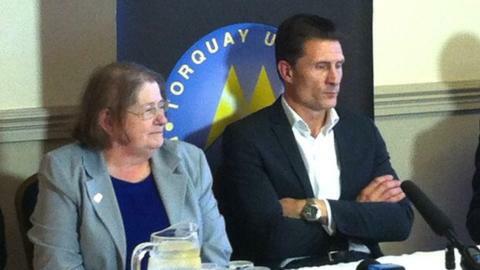 Torquay want a good FA Trophy run to help repay chairman Thea Bristow. They travel to Conference South side Bishop's Stortford on Saturday, having made the final in 2008. "We're looking to win the game to help the club so that Thea doesn't have to keep putting her hand in her purse," said manager Chris Hargreaves. "She's been brilliant, she's been a great support to me as manager, and to the club, so I want the players to win that game for her on Saturday." Lottery winner Bristow has been in charge since 2013, having inherited her late husband's place on the board three years earlier. The Gulls, who have only played in the competition twice before in their history, will receive £5,000 if they win on Saturday - with the club that eventually triumphs in the final netting £92,000 in prize money. But Hargreaves says he may make changes to his side to give some players a rest. "We are going to have to look at the squad because we're a little bit depleted at the moment," he told BBC Radio Devon. "In saying that, there are a couple on the fringes that are desperate to play so we go there full of confidence."